Conservation International, The National Geographic Society, the New England Aquarium and the Pacific Life Foundation today unveiled the Ocean Health Index, the first comprehensive measure of ocean health for 171 coastal regions worldwide. Findings from the Ocean Health Index, published today in the journal Nature, revealed a global score of 60 out of 100. Scores farther from 100 mean that we are either not maximizing the benefits from the oceans or we are not accessing those benefits in a sustainable way. The Index provides an important tool to policy-makers for making decisions in the future. Resource management decisions can be examined across the suite of goals allowing policy-makers to assess trade-offs. The Index is a framework that can be used at scales from global to very local – wherever quality data exists. Food Provision scored 24 out of 100, further reinforcing the need to improve fisheries management. Mariculture, a subset of Food Provision, also received one of the lowest scores (10 out of 100), revealing opportunities for countries to sustainably raise seafood to help meet the demands of the growing population and provide economic benefits. The highest-scoring locations included both densely populated and highly developed nations such as Germany as well as uninhabited islands, such as Jarvis Island in the Pacific. West African countries scored the lowest on the Ocean Health Index. These countries also rank low on the Human Development Index, suggesting a relationship between good governance, strong economies and a healthy coastline. ecosystems in the oceans and are a key component of the Ocean Health Index. Learn more. Scientists from the National Center for Ecological Analysis and Synthesis, the University of British Columbia’s Sea Around Us, Conservation International, the National Geographic Society and the New England Aquarium collaborated with ocean experts from universities, non-profit organizations, and government agencies to develop this landmark approach and digital platform. It has been designed to raise awareness of ocean issues, guide policy priorities, and facilitate a more inclusive and proactive approach to managing the oceans. By re-envisioning ocean health as a portfolio of benefits, the Ocean Health Index highlights the many different ways in which a coastal area can be healthy. Just like a diversified stock portfolio can perform equally well in a variety of market conditions, many different combinations of goals can lead to a high Index score. Consistent with this idea, the Ocean Health Index highlights the many options that exist for strategic actions to improve ocean health. 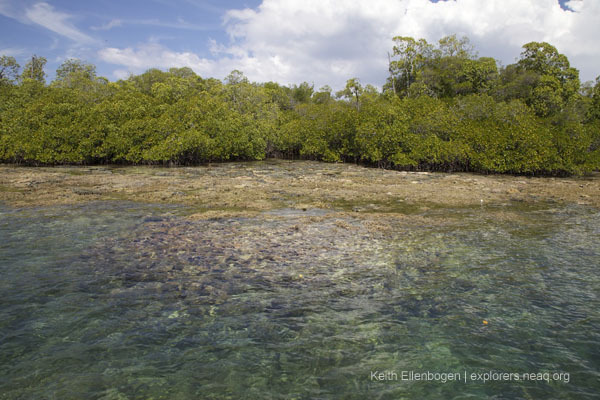 A photograph of mangroves in Indonesia with exposed Heliopora sp. (blue coral) in the foreground. in the Ocean Health Index. Learn more. More than 40% of the world’s population lives along the coast and as the world’s population grows from 7 billion to 9 billion by 2050, people are growing more and more dependent on the ocean for their food, livelihoods, recreation and sustenance. However, approximately 84% of monitored marine stocks are now fully exploited, overexploited, or even depleted. The capacity of the world’s fishing fleets is estimated to be 2.5 times sustainable fishing levels. “We believe that effective management of our oceans is critically important to help sustain the economies and people dependent on them,” said James Morris, chairman of the Pacific Life Foundation. “We are pleased to support the Ocean Health Index in order to help shape a new direction for global policy on the oceans.” The Pacific Life Foundation has committed up to $5 million towards the development and implementation of the Ocean Health Index. 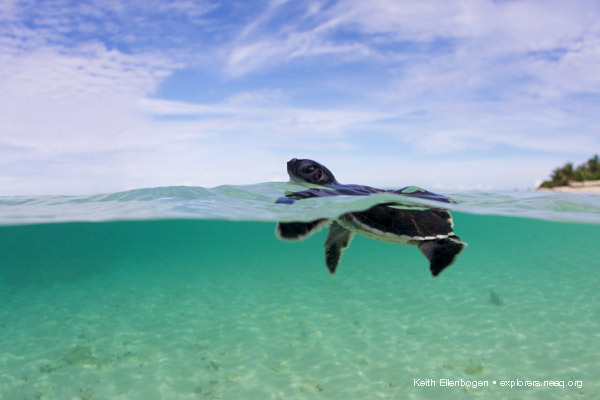 A newly hatched green sea turtle heads out to sea in the Turtle Islands of the Philippines/Malaysia. 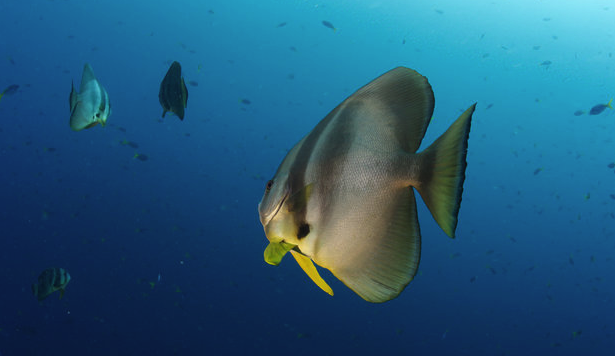 Protecting biodiversity is a key aspect of the Ocean Health Index. Learn more. (Photo: K. Ellenbogen). The lead scientific partners of the Ocean Health Index are the University of Santa Barbara’s National Center for Ecological Synthesis and Analysis in collaboration with the University of British Columbia’s Sea Around Us. The founding partners are Conservation International, New England Aquarium, and National Geographic Society. The Founding Presenting Sponsor is the Pacific Life Foundation. Darden Restaurants Foundation was a founding donor. The founding grant was given by Beau and Heather Wrigley. The authors readily acknowledge methodological challenges in calculating the Index, but emphasize it represents a critical step forward. “We recognize the Index is a bit audacious. With policy-makers and managers needing tools to actually measure ocean health—and with no time to waste--we felt it was audacious by necessity,” said Dr. Ben Halpern, lead author and scientist on the Ocean Health Index. 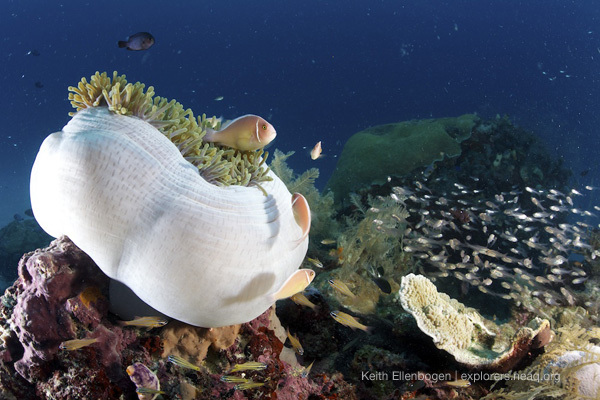 Photographer and videographer Keith Ellenbogen traveled to Indonesia, the Philippines and the California coast gathering many of the photographs and video in used to present the information on the Ocean Health Index website. Read his expedition posts from those travels on the Aquarium's Global Explorers Blog. The environment is often cited as an important factor influencing the health status of individuals. This includes characteristics of the natural environment, the built environment, and the social environment. Factors such as clean water and air, adequate housing, and safe communities and roads all have been found to contribute to good health, especially to the health of infants and children. Thanks.